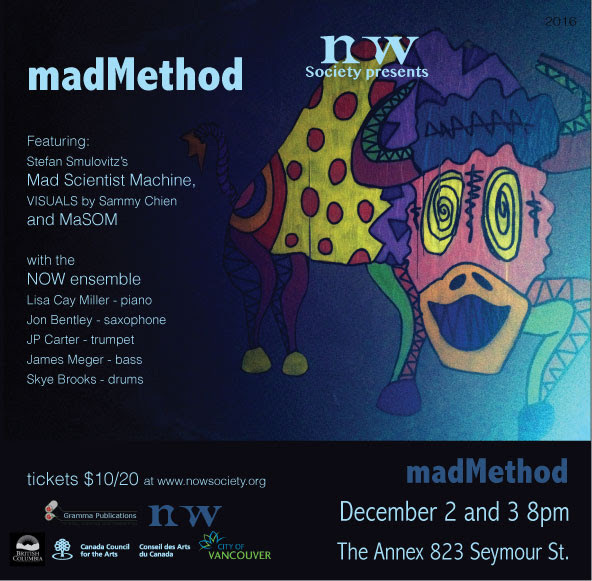 madMethod December 2 and 3, 2016 at The Annex Performing Arts Center at 8pmThe NOW Society presents madMethod, featuring Stefan Smulovitz’s Mad Scientist Machine, visuals by Sammy Chien and performances by MaSOM and the NOW ensemble. Layers of memory and experience combine light, images and sound, remembered, manipulated and instantly created. Audience members will look down upon the stage a story below and see images on the floor, the Mad Scientist Machine LED lights and listen to the sounds of the musicians as they respond to and inspire imagery.Lisa Cay Miller’s work Aventures I and III, originally performed in 2014 by the NOW ensemble, will be rearranged and performed by a little big band, which in parts be joined by MaSOM, the software agent trained to react with the original live recording. Sammy Chien will provide live video responding to the ensemble on December 2. On December 3, the NOW ensemble and guests will respond to the recorded imagery of the previous evening. And the Mad Scientist Machine will use color and intensity to cue the ensembles and visuals, Miller and Smulovitz conducting instant compositions. 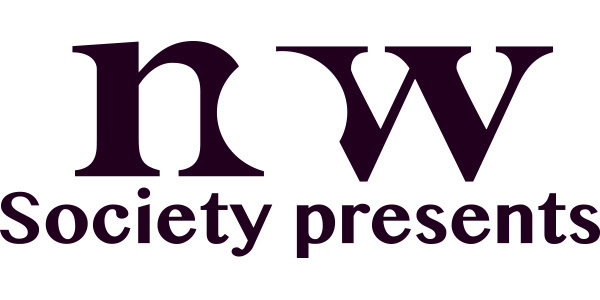 Tickets: $20 / $10 students/musicians Tickets and details available atwww.nowsociety.org and at eventbrite. The NOW ensemble is a five to ten-member ensemble with flexible instrumentation drawn from Vancouver’s finest improvising musicians. The music of the NOW is closely associated with Musique Actuelle and Creative Music, fusing improvisation and composition, the predetermined with the undefined. Events planned and unplanned are linked, craft and skill navigates the endless possibilities of the unknown. To pay tribute to the visionary composer and virtuosic listener Pauline Oliveros, the NOW Society will perform her graphic graffiti scores next Friday and Saturday, December 2 and 3. When the NOW Society first performed Stefan Smulovitz’s Mad Scientist Machine in November of 2010, Smulovitz requested that Oliveros send imagery for her conduction of the program. Oliveros sent six photos of graffiti for the Society’s use. The NOW ensemble, with guest artists Smulovits, Sammy Chien and MASAM, will proudly present these scores this weekend at the Orpheum Annex Theatre in Vancouver, honoring the legacy and and generosity of Pauline Oliveros.